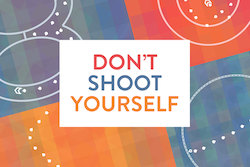 If you like puzzles and increasingly frantic arcade action, then Ayopa’s new indie hit, Don’t Shoot Yourself!, is the perfect game! Forums and games websites are buzzing about this hotly anticipated new game, and we’re offering it for 75% off in the launch sale event! You can check out the game’s free Unity Webplayer demo, or grab the whole phenomenal game from the App Store while the sale price is ridiculously low!